Every year in November, I make an effort to watch at least some of the Band of Brothers series. It's not a perfect series, but it stands as a reminder of the human cost paid by those serving in the war. This year, I watched episode 9, "Why We Fight". In this episode, Easy Company liberates one of the satellite work camps around the Dachau concentration camp. There is some artistic license in place: Easy Company did not liberate any of the camps, although they did see Dachau after it was liberated. It's a very emotional episode. That this is offered as the reason as to why the US entered the war, however, is a fiction. The subtext offered is that America went to war to fight tyranny, to stop evil like Hitler, the Nazis, and the Holocaust. In reality, America declared war on Japan after Pearl Harbour. Germany declared war on America four days after Pearl Harbour. There's a good article by On Violence which discusses this issue, including the broad feelings of antisemitism in America throughout the 1930s. It's easy to understand why Spielberg wants to promote this as one of the reasons for the war, but sadly, the "Final Solution" was not a primary concern of other nations, until after the concentration camps were liberated. But despite this, the episode is a powerful reminder of these concentration camps, and the horrors that were inflicted on the Jews, and other undesirables. Earlier this year, I also re-watched some war films, including a BBC mini-series on the concentration camps. "Auschwitz: The Nazis and the 'Final Solution'" was also called "Auschwitz: Inside the Nazi State" when aired by PBS in the United States. With documentary precision, this documentary builds up our understanding of how organized and widespread the whole extermination program was, and the mentality of the people keeping it going. In "Why We Fight", we don't get any real sense of scale. It's a smaller camp, but the focus remains on the reactions from the soldiers. It's a TV series about these soldiers, and it is through their eyes that we learn about the camps. Through their eyes, we get a glimpse inside one of the buildings in which men were piled like lumber. The Jews weren't the only ones persecuted in the war. After the bombing of Pearl Harbour, internment camps in the United States and Canada were opened, with a number of Japanese Americans and Japanese Canadians were segregated. In Canada, the [Japanese Canadian Interment] detained over 27,000 people of Japanese descent. In the United States, the number of Japanese American Internment detainees was in excess of 110,000. 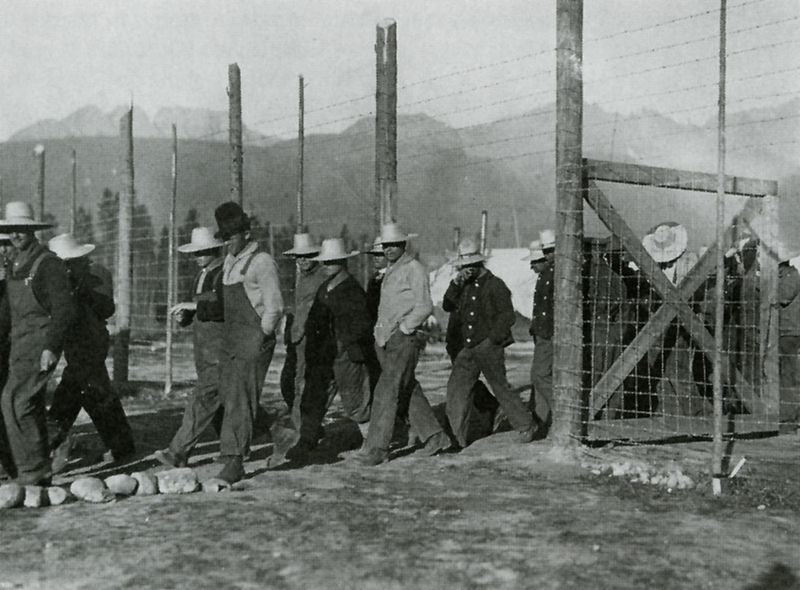 While these camps were not labour camps as in Russia, or extermination camps as in Germany, nonetheless, some of the same principles guided their creation: racial discrimination. In addition to removing all people of Japanese heritage to internment camps, their properties were also seized and sold below market prices. Similar camps held recent German immigrants. Jews who managed to escape Europe and fled to North America were likewise kept in prison camps, often alongside German prisoners. In World War I, Canada held 8,579 prisoners, mostly of Ukranian heritage, in a series of concentration camps from 1915-1920. Families uprooted, brought from their homes by armed soldiers, because their parents came from a particular country. While North American internment camps didn't result in mass executions, they uprooted thousands upon thousands of families. Is "at least we didn't kill them all" a good enough excuse? The basic liberties we take for granted, the ones which we say that our soldiers fought and died for, were being broken at home while they fought and bled. In America, the family of George Takei was relocated to the Rohwer War Relocation Center in Arkansas, before being transferred to the Tule Lake War Relocation Center in California. In Canada, David Suzuki's family was relocated to a facility in Slocan in British Colombia. While it's popular to imagine that only the "bad guys" would strip away the rights of their citizens, it's clear that this is not something that only Nazi Germany is guilty of. While they carried out mass executions, with little to no outcry, Americans and Canadians evicted and sold the properties of their own citizens, again with little to no outcry. As Takei notes in his post on Why we must remember Rohwer, almost nothing remains of these internment camps. While the existence of the extermination camps in Germany are well documented, there is an active attempt to disremember the failure of our own democratic principles in North America. This is why it matters. I haven't seen Allegiance, the musical inspired by George Takei's time at Rohwer, but shows like this are important, to tell the other stories from the war. Because the phrase "Lest we forget" shouldn't be one sided.